A series of tables and lists that summarise serial numbers, model codes and colors of the Ovation guitars from the beginning to the end of the 20th Century. The model 4 digit codes for the original models. Everything changed and became sort of messy from the Seventies, so the best way to be shure is using the Ovation Decoder. The dates in this chronology reflect actual appearances of models, determined from price lists and the recollections of sales representatives and dealers. They may differ slightly from the first production or official introduction dates in the text. 1964 Charles Kaman chose a small team of aerospace engineers and technicians, several of whom were woodworking hobbyists as well, to work to invent a new guitar. 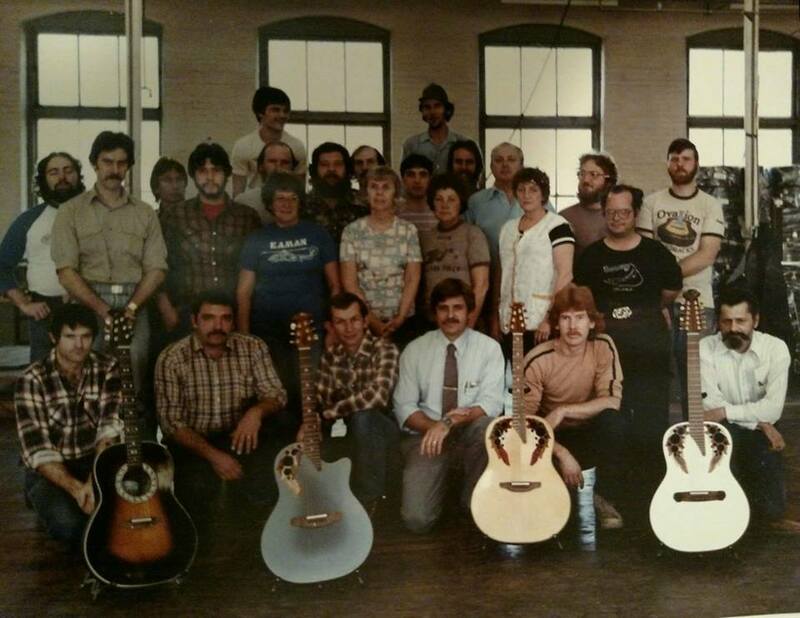 One of these was Charles McDonough, who later created the Ovation Adamas model. Kaman founded Ovation Instruments. 1965 Engineers and luthiers work to improve acoustic guitars by changing their conventional materials. The R&D team builds and tests prototype instruments. Their first prototype has a conventional dreadnought body, with parallel front and back perpendicular to the sides. The innovation is the use of a thinner, synthetic back, because of its foreseen acoustic properties. The company is moved from the aerospace facilities of Bloomfield to a new location in New Hartford. 1966 Balladeer introduced. Has a natural top, Grover Rotomatic tuners, dot fret markers, white-black-white binding, small or thin rosette with figure-8 chain link motif and grape bunch at 4 o’clock position. Less than 100 made before February 1967 move to New Hartford factory. The very early have no rosette, some have extra diamond fret markers at twelfth fret. 1967 (Feb.) Deluxe Balladeer introduced. Essentially a Balladeer with diamonds at twelfth fret, Grover Rotomatics (Balladeer now has Kluson tuners), five-ply top binding. 1967 (Sept.) Classic introduced. No fret markers, twelve frets clear of body, flat fingerboard. Josh White model introduced. Twelve frets clear of body, wider neck, steel strings, dot markers with diamonds at twelfth fret. Shaded brown sunburst top introduced. 1968 (Nov.) Glen Campbell models and shallow “Artist” bowl introduced. 1971 (May) K-1124 Country Artist introduced. Similar to the Josh White but with shallow bowl, fourteen-fret neck, flat fingerboard, and nylon strings, replaces Josh White as the #4 model. 1976 New top finishes introduced: Red, White, or Blue Patriot Bicentennial introduced. Limited run of 1776 guitars, fancy version of Custom Legend with drum-and-flag decal and “1776*1976” on lower treble bout. 1976 (Sept.) Adamas introduced in prototype form for artists and select dealers. The first 26 are prototypes; #27-#61 are a non-tooling production run; #62-#76 have a new headstock design and the Kaman bar neck reinforcement. Wooden epaulettes around soundholes change to a photographic Mylar material. Extensive tooling begins Sept. 1977. Dealers receive first production models in Dec. 1977. First production Adamas sold is a Model 1687, #0077-95. Suffix is guitar’s natural frequency resonance. The first Adamas 12-String is #213. Charles H. Kaman signs the labels up to #600. At #600 C.W. (Bill) Kaman II begins signing labels. 1981 Adamas II models introduced. Standard Ovation neck and bridge, available as acoustic electric only. Wood-top Adamas prototype produced. Number on label is N-19-82WTSL (WTSL for Wood Top Super Legend). Production model will be named Elite. 1982 (Oct.) Elite appears on price list; production begins shortly thereafter. First catalog appearance is late 1983. 1998 Introduced the Custom Legend Al Di meola.